Visitor Question: The City where I live has a definite zoning ordinance (Code 82.15) that states commercial vehicles are not to be parked in residential areas. There is a 25' towing truck parked in the driveway directly next door to me. Its exhaust fumes, which are directly next to my bedroom, have caused me to move into another room to sleep for health reasons. I have reported this to the City, but nothing has been done. Any suggestions? Editors Reply: Thank you for the great zoning question. In this situation, you definitely need to continue to escalate your reporting and requests for action until something is done. Yet we have to emphasize that this does not mean displaying anger or name calling. Remain civil and businesslike, and expect your city representatives to do the same. Our approach would be to report it yet again to the same person in the same way. Maybe he or she will get tired of you calling and eventually get around to taking action. Show empathy for that person too, because he or she may have received a subtle or not so subtle message that your city does not want to be seen as aggressive in zoning enforcement. But if you continue to call, that person may at least talk to a supervisor to raise the possibility that something should be done. While we assume that you are dealing with a city staff person, we would suggest that at the same time, you start talking with elected officials. If you have a ward-based, geographic system of electing your city council (or whatever it may be called in your location), talk first to that representative if you haven't. Where city council persons are elected "at large," meaning there is no geographic restriction on where each elected person lives, it becomes a little more complex. In that case, approach a council person who is visible, vocal, and not afraid to take a stand. If you are personally acquainted with a council member, that is a good place to start also. Depending on how much faith you have in the elected council person, you may decide to go to the mayor (or equivalent) right away also. Often in very small cities council people defer to the mayor on many decisions and complaints from taxpayers like you. When talking to elected officials, emphasize just two points. First, they have a law passed by a previous city council, and they should want to enforce it. After all, they would like subsequent city councils to insist on enforcing laws that they pass. Second, you have followed the process by reporting this obvious zoning violation to city staff. Yet action has not been taken, and you have a right as a citizen to understand why this is happening. Don't be overly critical of the staff member when you talk to a city council person or mayor, because after all, they may be friends. But do give the facts about when you called and what has happened as a result--in this case, nothing. Ask the elected official to investigate and report back to you, and ask them when they would be able to let you know what they find. This gives you an excuse to contact the elected official again if they too fail to report back to you. Be sure to take photographs of the tow truck at various times of day and in various weather conditions, so that city staff and officials understand that this is not an isolated instance of the tow truck being in the driveway once. 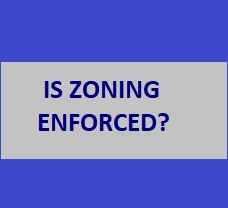 It is remotely possible that the inspector followed up on your complaint, did not see the tow truck in the driveway at that time, and therefore felt that he or she could not act to enforce the zoning ordinance properly. There are many blighted and neglected properties in the small city where I own property. This has severely depressed the value of my property. I have contacted the mayor, the city council, and the Board of Public Works, all to no avail. I just keep getting the excuse that the city does not have any money to enforce their Unsafe Building and Neglected Property ordinances. The Unsafe Building ordinance includes a provision for an Unsafe Building fund but apparently there is no means to transfer any money into this fund. What more can I do about this problem? Editors Comment: You are going to have to organize with your fellow property owners to let the elected officials know that the current state of affairs is just unacceptable. An unsafe building that is allowed to deteriorate to the point of collapse is a legal liability for the property owner and potentially for a city government that does not enforce its ordinances. Set up a meeting for you and other property owners to discuss this problem with the city attorney. Start sending letters to the city about each property that seems unsafe, and send a copy to the city attorney. Also you might ask any local planners or university extension people that live in your area if there are any state laws or county or state resources that could be used to start to address the situation. While enforcement does take some resources, such as having a qualified inspector, the expense involved is relatively small when compared to loss of property value and tax base in a deteriorating city. Perhaps they are thinking they would have to condemn each unsafe building, and it is true that legal expenses for the condemnation process can mount up. But you are well within your rights to insist on better explanations and more action.